Blue Kush Autoflowering cannabis seeds by Dinafem Seeds belong to a Sativa/Indica/Ruderalis, feminized, autoflowering cannabis strain that originates from the cross of a Auto Blueberry and a OG Kush Autoflowering. The result is an intensely fruity automatic strain that proudly displays the traits of its feminized predecessor. 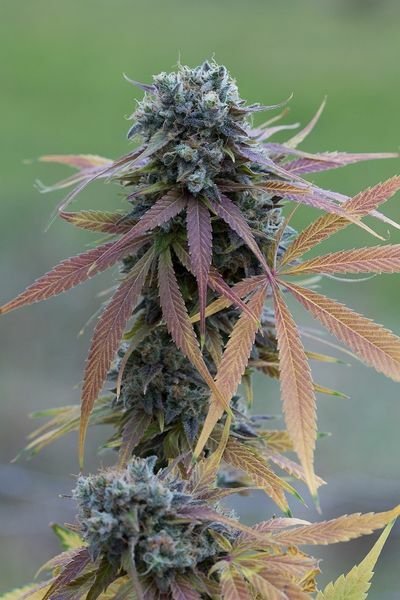 This automatic version of Blue Kush allows growers living in harsh climates to obtain a quality product both outdoors and indoors. Blue Kush Autoflowering marijuana seeds produce extraordinary, vigorous, easy-to-grow cannabis plants which reach a medium size, flower fast and yield delicious buds brimming with resin. Delicate, sweet and fruity, this strain is a treat for the senses. Blue Kush Autoflowering provides good results indoors, particularly in small spaces, as well as in outdoor warm, Mediterranean climates or in greenhouses. It is advisable not to overfeed it, to water it frequently but sparingly and to add 1/3 of coco to the soil in order to improve oxygenation.